South Africa is a country of contrasts, and as we traveled throughout its varied land, we experienced first world luxury and third world poverty and then some in between. We slept in rondavels (round thatched roof huts) and on futons, in apartments and cottages, in tent cabins, in game lodges and even in a tree house. We ate take out at the mall and fast food at the petrol station; we ate at a waterfront restaurant with heat lamps, and we self-catered, that is, we made our own food in communal or private kitchens where we were staying. So where did we do our business? A necessity and sometimes a luxury, we explored and experienced a variety of toilets during our month long stay in South Africa. I will describe a few of the more interesting and unique toilets we used in the next few posts. On the Wild Coast, we stayed at a hostel-like resort called Bulungula Lodge. The lodge is in the village of Bulungula, a village which has no electricity, no plumbing, and no mail service. We slept in our own rondavel with dirt floor, a window, a door and three futon beds, and whenever the need arose, we took a short walk outside and down a dirt path. The door of another hut opened to bright colors and murals of turtles, frogs, flowers and fish, each of six stalls personalized by its own mural in yellows, greens, oranges, blues, purples, pinks and reds. Each stall contained a composting toilet, a bucket of dirt and a shovel and driftwood holding a roll of toilet paper. The instructions on the back of the door told us what to do. These toilets were simpler than the composting toilets I’ve seen in the U.S., but the dirt covered the smell, so odors were not offensive. 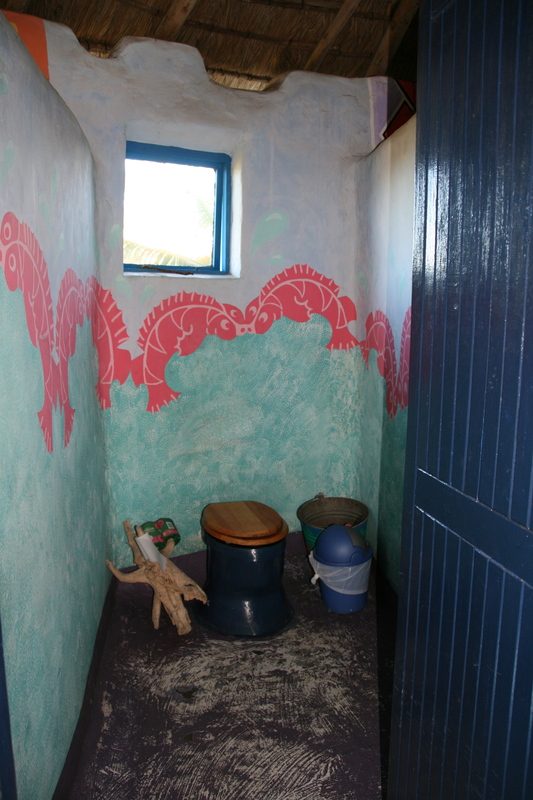 These were the only composting toilets we encountered in South Africa.